Millie was being camera shy yesterday here at Ruffledale. We tried all day without any success of getting any pictures. Her parents sent us some of Millie at home.... Here she is relaxing! And lastly, this is the silly Millie we know! We see a lot of this expression here! 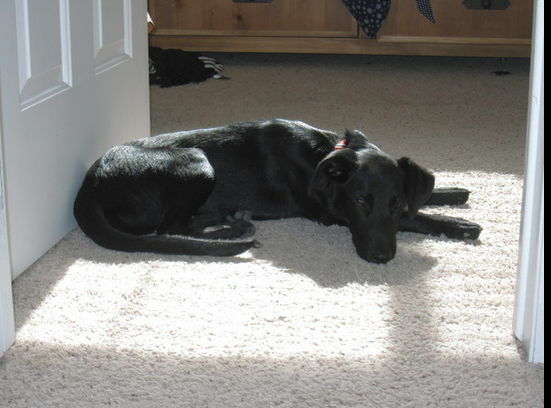 Millie is an extra sweet Whippet and Black Lab mix. The girls at Ruffledale also think she is half cat. She moves like a cat… ha ha She is very petite and weighs only about 30 pounds, but she definitely has a bigger personality than a little girl! Millie is a super duper escape artist. That is how we got to know Millie here at daycare. She escaped from her parents house by scaling a 5 foot fence to find out where they had went once they left for the day. After climbing the fence, she took advantage of her petite frame and slipped underneath another gate that was in her way. After a few escapes, Millie’s parents decided she needed to come to daycare to keep her busy during the day. Even here at daycare she is a sneaky girl. She likes to jump our back gates, but luckily not our fences. Millie is also a little digger to try to get where she wants to go. Millie was born in April of 2010 so she is just over a year old. Millie is a very socialable girl and loves everyone. Her best friend of all time is Maggie (May dog of the month) Maggie and Millie have grown up together here at daycare. They are so silly together but are also very happy to have other dogs in their “playgroup.” Millie’s family adopted her as a young girl, she is a rescue who couldn’t have found a better home. Millie’s family decided to get her after the loss of their 14 year old Tasi-dog. Tasi will of course always be dearly loved, but Millie has helped bring love and joy back to her family’s home after the loss. As much happiness as she brings, and as sweet as Millie is, she is also a little mischief maker! Millie loves to steal brand new bags of treats and has a special hide out at her house between the shed and fence where she can enjoy her loot! Her favorite of all treats to steal are salmon treats. Yum!! Millie LOVES playing fetch. She will play fetch outside multiple times a day if her parents will indulge her. She loves her tennis balls and anything else that she can fetch for her parents. A day without fetch is just not complete for Little Miss Millie! Just like any other dog, Millie has some things she doesn’t love. One thing is long drives in the car. She gets a little impatient being confined for too long. One of the worst things you can do to Millie is to “pretend” to throw a ball. It is very frustrating to be looking for something you can’t find! Poor Millie. She also doesn’t appreciate having air blow in her face, another negative for car rides. Millie is such a sweet girl. Her parents say she isn’t all sugar, but here at daycare we all think she is! She loves to play and when she wants a break from rough housing with her canine pals, she LOVES getting kisses from all of her people friends here! She is so sweet and gives us all the most gentle kisses. Millie is the perfect size to be a little lap girl! We all love when she is here. On days she misses, we miss having her sweet face here!